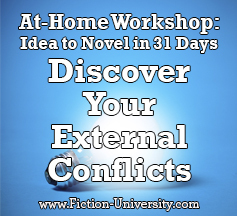 Welcome to Day Fourteen of Fiction University’s At-Home Workshop: Idea to Novel in 31 Days. For the rest of the month, we’ll focus on plot and the major turning points of a novel. There are two different kinds of conflicts every protagonist will deal with over the course of a novel—external and internal (the conflict of the plot, and the conflict of the character). These two conflicts will work together (usually by working against each other, ironically enough) to create the novel. We started thinking about conflict on Day Six, and now it’s time to flesh those conflicts out. Today, we’ll look at the external, and tomorrow we’ll focus on the internal. Conflict is at the heart of every novel. More than that really, it’s at the heart of every scene. It’s not uncommon for people to hear the word conflict and immediately assume fighting, but it’s not always violent, nor should it be. Conflict is just two things in opposition. Sure, it’s not life threatening, though it could be in the right circumstance. But what it does do is force the person with the conflict to make a choice. That’s what’s so great (and helpful in the plotting stage) about conflicts. Conflicts force characters to choose. And choosing forces them to act. Conflicts are the things standing in the way of the protagonist’s goal. The obstacles and challenges that must be overcome for her to get what she wants. A conflict can be a person, a situation, or a personal struggle—pretty much anything that prevents the protagonist from getting her goal or doing what needs to be done. But conflicts don’t have to be aggressive or even dangerous. Quiet conflicts are especially good for character-driven novels where the focus is more internal than external. Mom wants to take a nap after a long day; the kids want to play monopoly with her. What she wants is in conflict with what they what. This isn’t going to turn into a literal fight, and there’s no bad guy here; just two sides that both want something different and are willing to act to get what they want. And that’s key to non-violent trouble. Different wants. Because wanting something isn’t the same as doing something violent to get it. The core conflict is the ultimate problem the book is trying to resolve. It triggers the series of obstacles the protagonist will have to deal with throughout the story. Discovering this problem is the beginning of the novel, and resolving this conflict is the end of the novel. In plot-driven novels, this is where the main focus of the book lies. We’ve already done a lot of work to determine the type of conflict the story has, what’s driving it, and who the protagonist and antagonist are, so you should have a solid idea of what the core conflict is (that’s why we waited until now to focus on this critical aspect of the story). EXERCISE: Summarize your core conflict and why it’s a problem for your protagonist. This will be the heart of your plot. It will guide you when deciding the types of problems your protagonist will face in the book, and remind you what the story is about if you get stuck during your draft. What Are Your External Conflicts? The core conflict isn’t the only conflict in your story, however. You’ll have other external conflicts that will be the external obstacles in the protagonist’s way that will require choices and actions to resolve or overcome. They’re the external problems standing in the way of what the protagonist needs or wants. The external conflicts help create the plot. Why external conflicts are important: External conflicts give the protagonist something to do. 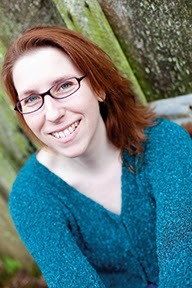 They provide the obstacles and goals the protagonist has to resolve to get what she wants and save the day. They get her moving, make her proactive, and force her into situations where she has to make those reader-hooking choices that drive the plot forward. 1. What are the external conflicts in the book? List five possible conflicts (these will likely include the various steps needed to resolve the core conflict). 2. How might these conflicts keep the protagonist from getting what she wants? List how and why. 3. What are some other possible conflicts in your idea? 4. What characters might be in conflict with each other? 5. What larger conflicts might occur in your world or setting? EXERCISE: Summarize your external conflicts and how they might fit in to your story. This is a good opportunity to think about how your plot will unfold, what subplots you might have, and where the problems in your story might occur. Those following along with the PYN book: Workshop Five goes into more detail on creating conflict and developing a strong story structure to illustrate that conflict. If you’re struggling with conflict, I recommend my new book, Understanding Conflict (And What It Really Means). 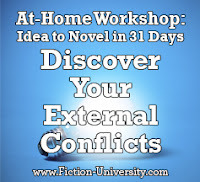 It goes into great detail on what conflict is (and isn’t) and how writers can use it in their fiction. Tomorrow, we’ll look at creating the internal conflicts. 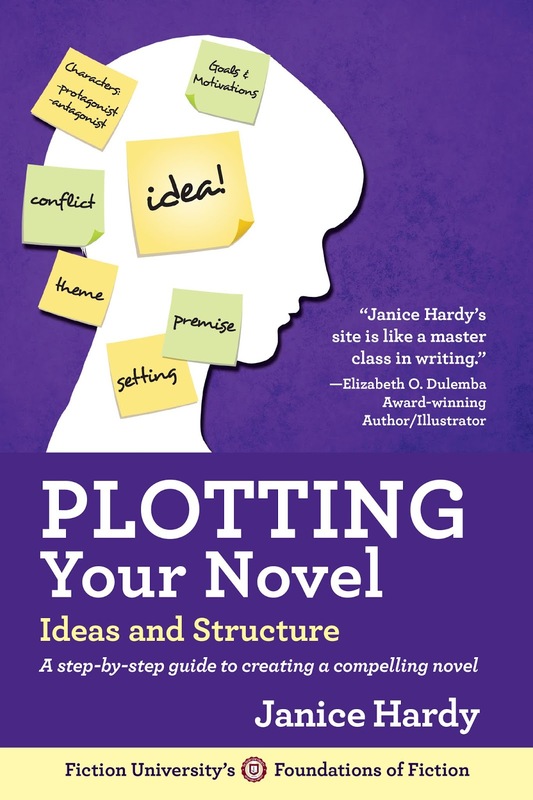 Follow along at home with the book, Plotting Your Novel: Ideas and Structure. Get more brainstorming questions and things to think about, in-depth articles, and clear examples of every step from idea to novel.